The dose delivered by an electron beam to a particular depth has a complex dependence on the beam energy, design of the collimator system, any field shaping shields, and size and shape of the treatment field. Some commercially available planning systems use the pencil beam algorithm to account for tissue inhomogeneities, patient curvature, and irregular field shape, but due to its limitation, it usually fails to prove the accuracy needed in dose calculation for general clinical purposes. Electron Monte Carlo algorithm, on the other hand, has been developed to improve the accuracy in predicting a dose distribution due to an incident electron beam. It is particularly useful when there are geometrically complex inhomogeneities. Due to the principle of the algorithm, Monte Carlo calculations usually involve statistical uncertainty, depending upon the number of histories calculated. In any case, the monitor units (MUs) calculated by the planning system should be verified independently for quality assurance purposes. This second verification is usually done through an independent MU calculation. AAPM TG 71 provides the equation of performing the MU calculation for electron beams at the nominal source-surface distance (SSD), which is given below in equation (1). where D is the absorbed dose at the point of interest from the individual field under calculation; D0' is the dose rate of the user's beam under normalization conditions; d is the depth of the point of calculation; percentage depth dose (PDD) (d, ra, SSD) is the percent depth dose; d0 is the normalization depth for electron dosimetry; ra is the applicator size for electron beams; r is the side of the equivalent square for the field size incident on patient defined at the surface; Se (ra,SSD0) is the output factor (OF) for electron beams; SSD is the SSD; SSD0 is the standard SSD; SSDeff is the effective SSD; g is the difference between the treatment SSD and the calibration SSD; and accounts for the effect of treatment not equal to the standard SSD. In this equation, one key component of determining the final MU required for an electron treatment is the OF, defined as the dose rate at a reference depth of a given field size divided by the dose rate at the same point and depth for the reference field size. OFs can be measured for every cutout used clinically, but in a busy radiation therapy department, making many measurements on linear accelerators that are in heavy clinical use is not practical. Based on the equation, different software have been developed to perform the MU calculation for electron beams. At the author's department, two verification programs are available: RadCalc ® (LifeLine Software Inc., Austin, USA), a commercially available independent dosimetric verification program, and eDatabook (Y. Wang, Radiation Oncology Institute, Sydney, Australia), an in-house developed look-up-table based MU calculation program. At standard SSDs, both software packages calculate electron OFs based on equation (1), but at nonstandard SSDs, they use different method to calculate the SSD correction. In this study, after commissioning RadCalc and eDatabook with the same set of commissioning data, the authors calculated electron OFs of various clinical irregular cutouts at both standard SSD and extended SSDs from the two software packages and compared the results to the measurements to validate the software packages' accuracies under these conditions. The linear accelerator used is an Elekta Synergy linear accelerator, with five available electron energies (6 MeV, 9 MeV, 12 MeV, 15 MeV, and 18 MeV) and five electron applicators (A6, A10, A14, A20, and A25). To commission RadCalc and eDatabook, a series of electron cutouts were made in different applicators as listed below in [Table 1]. Cutout dimensions in the table are specified at 100 cm SSD. PDD data were required for both programs. PDDs for all cutouts listed in [Table 1] are measured with the available electron energies at 98 cm, 100 cm, and 110 cm SSDs. Due to the need of a high spatial resolution, all the PDDs were measured with an electron diode (Scanditronix Wellhofer DEB002–3572) pointing upward with IBA blue-water scanning system. Data were processed (smoothed, normalized, and converted into dose curve) in OmniPro version 6.5. OFs were required for both programs. 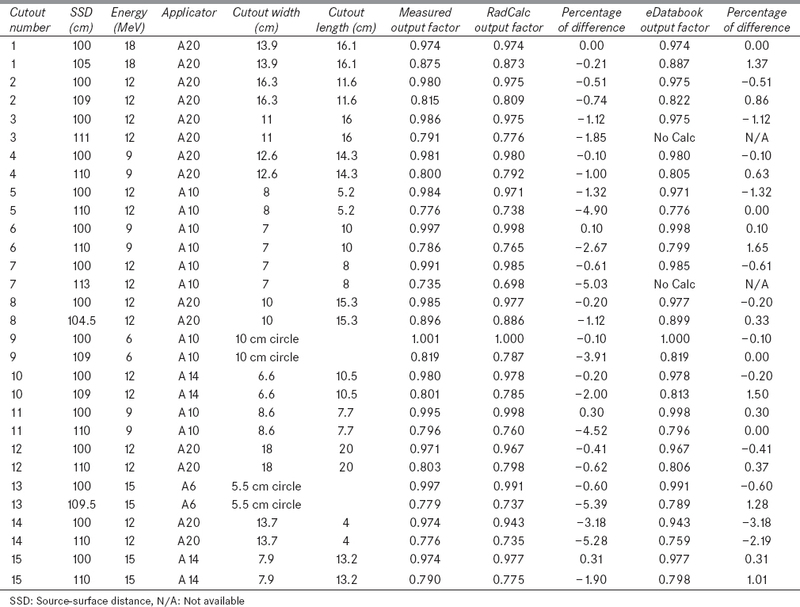 OFs for all cutouts listed in [Table 1] were measured with the available electron energies at 98 cm, 100 cm, and 110 cm SSDs. OF measurements were made with the same electron diode connected to a Keithley electrometer (MK614, SN 496163) at the user-defined depth, which was determined by the R100 value of the 20 cm × 20 cm depth dose curve at 100 cm SSD. All measurements were normalized to the 10 cm × 10 cm reading at 100 cm SSD to calculate the OF. Only RadCalc requires effective SSD determination for its Inverse Square Factor (ISF) correction. The method suggested by Khan  was used in the determination of effective SSDs. Effective SSD measurements were made in RW3 white solid water phantoms instead of the blue-water scanning system due to the time frame. Ideally, an electron diode should be used in measuring the effective SSDs, but as a solid-water chamber insert slab was not available for the electron diode, instead a Roos chamber (PTW34001, 01834) was used together with the Keithley electrometer to measure all the data for determining effective SSDs. An uncertainty level of <1.0% was estimated for the measurement system. In RadCalc, effective SSD only relates to the square cutout size and is not specific with applicator size. Consequently, effective SSDs were determined with a selective of regular square cutout fields, i.e., 3 cm × 3 cm (in A6), 4 cm × 4 cm (in A6), 6 cm × 6 cm (in A6), 10 cm × 10 cm (in A10), 14 cm × 14 cm (in A14), 20 cm × 20 cm (in A20), and 25 cm × 25 cm (in A25), defined at 100 cm SSD. Due to the finite size of the sensitive volume of the Roos chamber, 2 cm × 2 cm field was not measured. This is acceptable as the department's protocol prohibits the use of field sizes smaller than 3 cm × 3 cm for an electron treatment. After their determination, the effective SSDs were input into RadCalc with the corresponding cutout size. In RadCalc, the option of “Enter Effective SSDs based on Cutout Size” was ticked, and a plot of effective SSDs versus field sizes was generated in the software based on the measurements. Effective SSDs for those field sizes that are not measured directly will be obtained from this plot. To test these two softwares' performance on clinical cases, 15 clinical patients' irregular cutouts were used. OFs for the clinical cutouts were measured at the standard SSD (100 cm) and the clinically-used SSDs using the same dosimetry system and setup described in the software introduction section of this chapter. PDDs for all clinical cutouts were measured to determine the Dmax depth of each cutout. Due to the timeframe instead of the blue-water scanning system, Gafchromic ® EBT3 film was used with solid water phantoms in the PDD measurement for the clinical cutouts. No calibration for the film was required as it is a relative measurement. These measured OFs were compared to the calculated factors from eDatabook and RadCalc to test the accuracy of both software packages at standard and extended SSDs. EDatabook and RadCalc calculate electron OFs based on equation (1). To calculate the OF at the standard SSD, both programs use the same linear interpolation method to determine the output if there is no direct measurement available and then use equation (1) to calculate the MU, where in this case, the SSD correction factor equals one. On the other hand, at extended SSDs, RadCalc and eDatabook use different methods to correct for the effect of the treatment distance not equal to the standard SSD and to interpolate data for nonmeasured cutout sizes or SSDs. When looking up OFs for a calculation, RadCalc will find all of the square cutouts for the selected cone and energy. It will examine the SSD of the cutout and then remove the inverse square effect from the cutout measurement if the cutout contains an ISF. Then, RadCalc will perform a double interpolation to get the OFs for the desired field size. The inverse square effect will be placed back in the final calculation using the appropriate effective SSD. However, for eDatabook, if measurement is not directly available at a nonstandard SSD, the software looks for the measured data of the adjacent available SSDs with the same field size and performs a linear interpolation. If the field is not square, it will do the interpolation for both width and length, and then use the square root correction to determine the final OF. An example is given below for the calculation of the OF of a rectangular cutout at an extended SSD. The OF of a 4 cm × 5 cm rectangle in the A6 applicator, 6 MeV, at an SSD of 105 cm, needs to be determined. The commissioning data collected that will be used in this calculation include OF of a 4 cm × 4 cm cutout in A6 at 100 cm SSD (R1); OF of the same cutout at 110 cm SSD (R2); OF of a 6 cm × 6 cm cutout in A6 at 100 cm SSD (R3); and OF of the same cutout at 110 cm SSD (R4). For irregular- or circular-shaped cutouts, RadCalc uses either square root method  or sector integration method  to determine the OF. The sector integration method is designed to work best with circular cutouts. As during the previous commissioning only square OFs were measured, circular cutout data were not available. Hence, in this study, all OFs calculated from RadCalc use square root method. If the cutout shape is circular or irregular, eDatabook requires the user to measure the smallest dimension in X and Y axis to input into the software. The software then approximates the irregular cutout as a rectangle whose dimensions are equal to the input smallest dimensions with a few assumptions. The equivalent-square method ,, is then used for interpolation. Since electron treatments at extended SSDs are of clinical usefulness in the treatment of some sites (e.g., head and neck tumors), it is important to be able to calculate the OFs at the extended SSDs correctly. Only in this way, these verification programs can provide a valid verification to the planning system and thus give physicists confidence in electron treatments at nonstandard-SSD treatments. [Table 2] lists the details of the clinical cutouts used and the difference between the calculated OFs from RadCalc and eDatabook and the measured OFs. At the standard SSD (100 cm), RadCalc and eDatabook show exactly the same results as they use same interpolation method at the standard SSD. What is worth mentioning is that for cutout No. 14, both programs demonstrate a bad agreement between the prediction and the measurement even at the standard SSD. This is most likely due to the lack of lateral scatter equilibrium as the smallest dimension of that cutout is only 4 cm measured with a relatively high energy of 12 MeV. For electron beams, if the edge of the field is shorter than the range of the laterally scattered electrons, lateral scatter equilibrium does not satisfy, and the OF as well as depth dose can be significantly reduced compared with the broad beam distribution. Using square root method to estimate the field size will not account for this effect of reduced dose rate, and consequently, both programs show a poor agreement with this measurement even at standard SSD. At nonstandard SSDs, two programs show different results due to the different methods they apply in correcting the SSD effect. RadCalc applies the effective SSD ISF correction method according to AAPM TG71, while eDatabook uses direct linear interpolation between existing data at two different SSDs. In general, at nonstandard SSDs, eDatabook shows a significantly better agreement to the measurements than RadCalc. However, as observed from Cutout No. 3 and No. 7, eDatabook cannot calculate OFs beyond the maximum measured SSD (in this case 110 cm) as it relies on interpolation. RadCalc, on the other hand, can do so because it only interpolates between data at the same SSD, and then applies the ISF factor. However, its accuracy at these extreme SSDs is not optimal compared to the measurement. The difference of RadCalc and eDatabook in calculating OFs at extended SSDs is whether effective SSD is used or not in the calculation. As in general, RadCalc yields worse agreement with measurements than eDatabook at extended SSDs, the authors suspect that the most likely reason would be the effective SSD values used in the ISF corrections in RadCalc. The effective SSDs that were imported into RadCalc were measured with standard square cutout fields. However, when it comes to a clinical cutout, its shape could be well irregular, and thus its effective SSD value may not follow the effective SSD curve established in RadCalc using regular square fields. To further investigate, the effective SSDs for all clinical cutouts based on the OFs measured at two different SSDs were calculated. 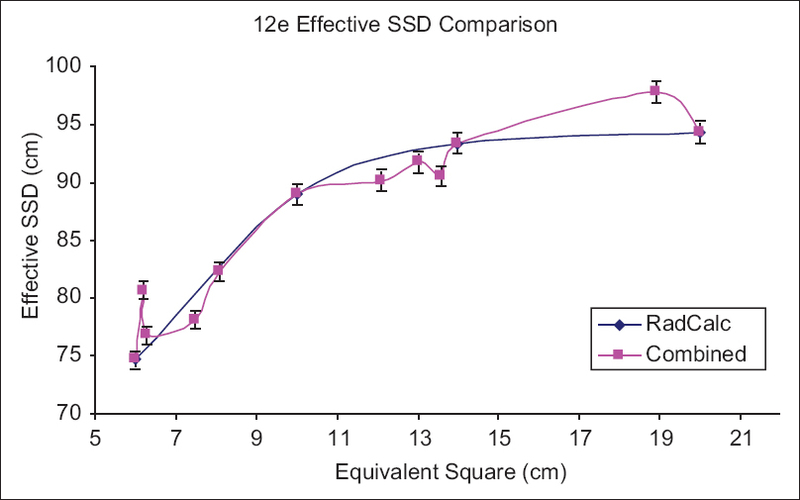 Then the author combined these calculated effective SSDs with the effective SSDs calculated from the regular cutouts and plotted them against the corresponding equivalent square field size to establish an effective SSD curve. This curve is compared to the one in RadCalc. Many of the clinical cutouts (8 out of 15) were measured with 12 MeV electrons. As a result, the 12 MeV curve has the most data points and thus is the most representative for the comparison. 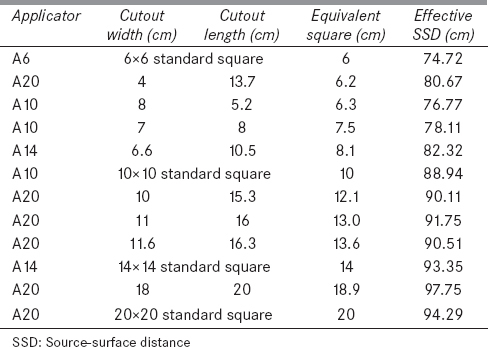 [Table 3] lists the effective SSDs measured during commissioning using regular cutouts and the effective SSDs calculated from clinical cutout measurements. [Figure 1] shows the effective-SSD curve initially imported in RadCalc, and the effective-SSD curve that has also combined values calculated from clinical measurements. It is clearly noted from the graph that for irregular cutouts, the effective SSD does not follow a polynomial interpolation based on the cutout size. The value is also related to the shape of the cutout, the applicator used in conjunction, whether electron equilibrium is achieved, etc., and cannot be predicted easily from solely regular-cutout data. Due to this variation, RadCalc fails to calculate the OFs accurately at extended SSDs as its calculation is based on the assumption that the established effective-SSD curve can accurately predict the data where there are no measurements available. 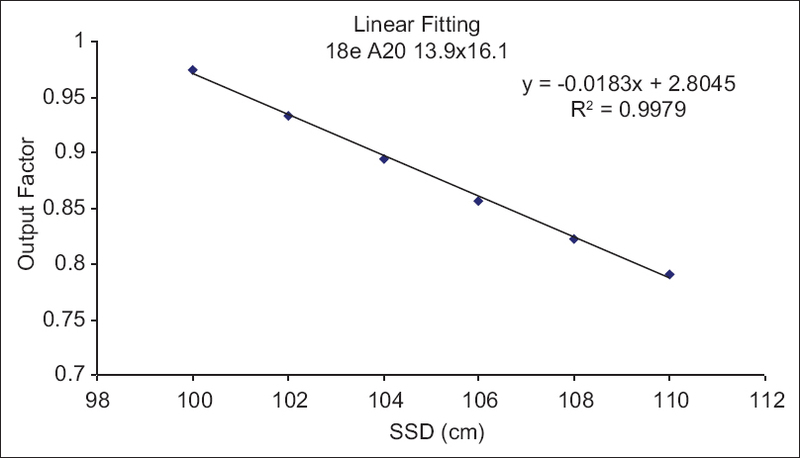 For a certain cutout, whether regular or irregular, if its effective SSD is determined from two OF measurements, one at the standard SSD (100 cm), the other at a large extended SSD (e.g., 110 cm SSD), then all other OFs at SSDs in between this range can be calculated for this cutout using the inverse square law, as long as the Dmax value of this cutout is known. To confirm for a certain cutout, whether the OFs follow a linear relationship or not, the OFs at various SSDs were calculated using the determined effective SSD for each clinical output. The results were plotted and a linear fitting to the curves was applied. The R2 value for each plot tells whether the curve follows a linear relationship or not for each cutout. The result is shown in [Table 4]. An example of the linear curve fitting is given in [Figure 2]. It is found that for all the cutouts, the R2 value for the linear fitting is > 0.9970. This means that for a certain cutout, its OFs follow a linear relationship at a generally acceptable level within the clinical treatment SSD range. This proves the accuracy of eDatabook in using a linear interpolation to determine the OF at an extended SSD when there are no measurement data available. Two independent MU checking software packages were compared to OF measurements of irregular electron cutouts at both standard and extended SSDs. The results show that with the majority of the cases tested, eDatabook performs better than RadCalc at determining the actual electron OF at the extended SSDs when compared to actual measurements. This is because eDatabook uses linear data interpolation, which is proven valid for different cutout shapes while RadCalc relies on applying inverse-square correction using effective SSDs, which cannot be predicted accurately from curves established with only standard cutouts. To ensure RadCalc calculates the OF of an irregular cutout at extended SSDs accurately, the effective SSD of that cutout must be measured individually instead of being interpolated, which is too time-consuming and not realistic in a busy radiation therapy center. On the other hand, once enough data have been collected during commissioning, eDatabook will not require any further individual measurement to provide a more accurate OF measurement for any cutout shape at any SSD. There are some limitations to this study that the authors are aware of: (1) As final-calculated MUs from the software packages cannot be compared directly to chamber measurements, this study only focuses on comparing the calculation of OFs but not the final MUs; (2) due to the timeframe, effective SSDs were determined from measurements made from a Roos chamber in solid water phantom rather than an electron diode, which is a potential error source as all other data were collected with electron diodes; and (3) eDatabook uses equivalent-square method to determine the field size of irregular cutout, which is not as accurate as the sector integration method especially for highly irregular field, and does not account for the effect of electron disequilibrium if the field size is too small to provide lateral scatter equilibrium for the selected electron energy. To improve these limitations, in the next study, the authors will collect more data to add into the database for comparison and analysis. Instead of only comparing the OFs, the authors are also planning to compare the final electron MUs from both software packages with commercially available radiation therapy planning systems and manual calculations based on measurements. The authors are currently commissioning an Electron Monte-Carlo planning system (RayStation, RaySearch Americas Inc., NY, USA) and will use the planning system as a third subject to compare to the software packages in electron MU calculation. Jursinic PA, Mueller R. A sector-integration method for calculating the output factors of irregularly shaped electron fields. Med Phys 1997;24:1765-9. Podgorsak EB. Radiation Oncology Physics: A Handbook for Teachers and Students. 1st ed. Vienna: International Atomic Energy Agency; 2005. Metcalfe P, Kron T, Hoban P. The Physics of Radiotherapy X-Rays and Electrons. 1st ed. Madison: Medical Physics Publishing; 2007. Gibbons JP, Antolak JA, Followill DS, Huq MS, Klein EE, Lam KL, et al. Monitor unit calculations for external photon and electron beams: Report of the AAPM Therapy Physics Committee Task Group No 71. Med Phys 2014;41:031501. Khan FM. The Physics of Radiation Therapy. 3rd ed. Philadelphia: Lippincott Williams & Wilkins; 2003. Lifeline Software Inc., RadCalc User Manual, Version 6.2 Rev A., Emergo Europe, The Netherlands, 2012. Shiu AS, Tung SS, Nyerick CE, Ochran TG, Otte VA, Boyer AL, et al. Comprehensive analysis of electron beam central axis dose for a radiotherapy linear accelerator. Med Phys 1994;21:559-66. Biggs PJ, Boyer AL, Doppke KP. Electron dosimetry of irregular fields on the clinac 18. Int J Radiat Oncol Biol Phys 1979;5:433-40. Nair RP, Nair TK, Wrede DE. Shaped field electron dosimetry for a Philips SL75/10 linear accelerator. Med Phys 1983;10:356-60. Rashid H, Islam MK, Gaballa H, Rosenow UF, Ting JY. Small-field electron dosimetry for the Philips SL25 linear accelerator. Med Phys 1990;17:710-4. Al-Ghazi M, Sehgal V, Sanford R, Chung H. Experimental investigation of the implementation of Fermi-Eyges-Hogstrom electron beam model of the Pinnacle3 system at extended SSDs. Med Dosim 2007;32:200-3. Carpenter RG. Principles and procedures of statistics, with special reference to the biological sciences. Eugen Rev 1960;52:207-8.